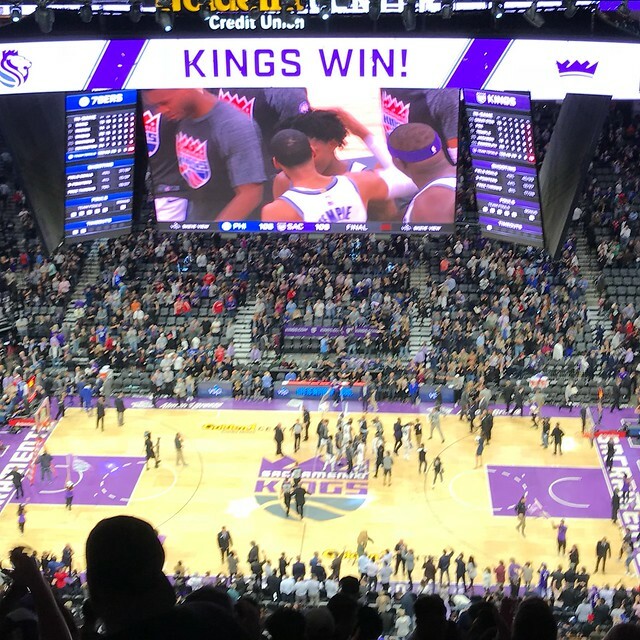 Larkin and I went to the Sacramento Kings versus Philadelphia 76ers NBA Basketball game at the Golden One Center. It was a close game for four quarters. Falling behind in the last couple of minutes, the Kings rallied to win by score of 109 to 108. Robert Covington was the high scorer for the 76ers. He had 24 points on 7 for 16 from the field, 6 for 12 from three and 4 for 5 from the free throw line. Zack Randolph was the Kings leading scorer. He had 20 points on 7 for 14 from the field, 2 for 2 from three and 4 for 6 from the free throw line. I spent most of the evening focusing on either Fox, Simmons or Embiid rather than following the ball. Although he hit the game winning shot, Fox had a horrible shooting night. In 30 minutes, he had 11 points on 4 for 13 from the field. Fox missed a number of lay-ups and floaters. Simmons got in foul trouble in the first half, but still ended up with 18 points (6 for 8) and 6 assists in 27 minutes. Embiid looks out of sorts. Although he had 22 points (7 for 20) and 15 rebounds, he just didn't look like the dominant, mobile player I saw against Cousins last season. At one point, he tripped over his own feet. At half-time, I ran into Sharon's nephew Kevin. He was at the game with his brother Eric; they are 76ers fans?!?. Including preseason, the Kings have 2 wins and 0 losses in games that I have seen in the 2017-2018 season.